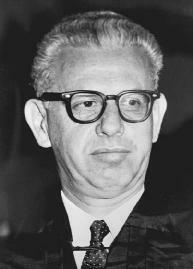 Arthur Joseph Goldberg served as a justice of the U.S. Supreme Court from 1962 to 1965. A distinguished Labor Law attorney, Goldberg also served as secretary of labor in the administration of President john f. kennedy from 1961 until his judicial appointment and as ambassador to the United Nations from 1965 to 1968 during the administration of President lyndon b. johnson. Johnson persuaded a reluctant Goldberg to resign from the Supreme Court to accept the U.N. assignment. Goldberg was born August 8, 1908, in Chicago, to Russian immigrants. He graduated from Northwestern University Law School in 1929 and entered the field of labor law in Chicago. Goldberg gained national attention in 1939 as counsel to the Chicago Newspaper Guild during a strike. He served in the Office of Strategic Services during World War II and then returned to his labor practice in 1944. In 1948 he became general counsel for the United Steelworkers of America, a position he held until 1961. The steelworkers union was an important union during a time when U.S. heavy industry was thriving. Strikes or the threat of strikes in the steel industry had national repercussions. Goldberg proved adept in his role as general counsel, skillfully negotiating strike settlements, consolidating gains through Collective Bargaining, and helping with public relations. From 1948 to 1955, Goldberg also was general counsel for the Congress of Industrial Organizations (CIO), which contained most nontrade unions, such as those controlling manufacturing and mining jobs. The CIO had been created when the Trade Union members of the american federation of labor (AFL) showed no interest in organizing these industries. There was a great deal of friction between the CIO and the AFL, yet the leadership of both organizations realized that a unified labor movement was a necessity. Goldberg was a principal architect of the 1955 merger of the CIO and AFL into the AFL-CIO. He then served as a special counsel to the AFL-CIO's industrial union department from 1955 to 1961. In 1961 President Kennedy appointed Goldberg secretary of labor. During the less than two years that Goldberg held this office, he saw congressional approval of an increase in the Minimum Wage, and the reorganization of the Office of Manpower Administration (now the Employment and Training Administration). When Justice Felix Frankfurter retired from the Supreme Court in 1962, Kennedy appointed Goldberg to the "Jewish seat." The so-called Jewish seat began with the 1939 appointment of Felix Frankfurter, who was Jewish, to succeed Justice benjamin cardozo, also Jewish. It was assumed that for political reasons, Democratic presidents would appoint a Jewish person to that vacancy. This tradition ended with the appointment of Abe Fortas. "Law not served by power is an illusion; but power not ruled by law is a menace which our nuclear age cannot afford." The appointment of the liberal Goldberg, replacing the conservative Frankfurter, turned a four-justice liberal minority on the Court into a five-justice liberal majority, which was led by Chief Justice Earl Warren. Goldberg became known as an innovative judicial thinker who moved the Court toward liberal activism. He usually joined the majority of Warren Court justices in extending the Court's rulings into areas previously considered the realm of the states and of Congress. He was also an able negotiator within the Court, helping to smooth the way in reaching difficult and controversial decisions. Goldberg was a firm supporter of Civil Rights and civil liberties. His best-known opinion came in the areas of Criminal Law and Criminal Procedure, when he wrote the majority opinion in escobedo v. illinois, 378 U.S. 478, 84 S. Ct. 1758, 12 L. Ed. 2d 977 (1964). In this case the Court struck down a murder conviction because the defendant had been denied the right to confer with his lawyer after his arrest. This decision was a major step toward the landmark decision in miranda v. arizona, 384 U.S. 436, 86 S. Ct. 1602, 16 L. Ed. 2d 694 (1966), which gave suspects the right to be advised of their constitutional rights to remain silent, to have a lawyer appointed, and to have a lawyer present during interrogation. Goldberg believed in the constitutional right of due process. In a dissenting opinion in United States v. Barnett, 376 U.S. 681, 84 S. Ct. 984, 12 L. Ed. 2d 23 (1964), he argued that federal judges should not be allowed to use their Contempt power to send persons to jail. When punishment for contempt of court could be meted out, the person held in contempt should be entitled to a jury trial. Although he did not prevail in Barnett, his dissent drew attention to the abuses of this practice and helped reduce it. In 1965 Goldberg appeared to have a promising judicial career. Yet he became one of the few justices to give up his lifetime appointment to the Supreme Court for a reason other than retirement. In the summer of 1965, President Johnson asked Goldberg to resign from the Court and accept the U.S. ambassadorship to the United Nations, promising a larger role in foreign policy than was traditionally given to the U.N. delegate. Goldberg did so reluctantly and regretfully. When Johnson appointed his friend and political confidant Abe Fortas to replace Goldberg, many believed this had been the primary motive in offering Goldberg the U.N. post. Goldberg's major achievement as U.N. ambassador was his aid in drafting Security Council Resolution No. 242 (22 SCOR 8–9, U.N. Doc. S/INF/Rev. 2), passed in November 1967, concerning peace measures in the Middle East. Goldberg tried continually and unsuccessfully to make the United Nations play a role in a peace process that would end the Vietnam War.His efforts were met with disfavor by Johnson and by Johnson's advisers. Frustrated and disappointed by the failure of these efforts and the escalation of the war, Goldberg resigned his U.N. position in 1968. After his resignation Goldberg joined a New York City law firm and also served in 1968 and 1969 as president of the American Jewish Committee, a national Human Rights organization. He ran for governor of New York in 1970 as the Liberal-Democrat candidate, but incumbent Nelson A. Rockefeller soundly defeated him. He then returned to Washington, D.C., where he resumed a private law practice. In 1977 and 1978, Goldberg was a U.S. ambassador-at-large in the administration of President jimmy carter. Following this assignment, he became deeply involved in the international human rights movement, a cause he pursued until his death. Goldberg wrote several books, including AFL-CIO Labor United (1956), Defense of Freedom (1966), and Equal Justice: The Warren Era of the Supreme Court (1972). Goldberg died January 19, 1990, in Washington, D.C.
Stebenne, David L. 1996. Arthur J. Goldberg: New Deal Liberal. New York: Oxford Univ. Press. While Brandeis became an ardent Zionist later in life, Arthur Joseph Goldberg was committed to building up a Jewish state in Palestine throughout his life.